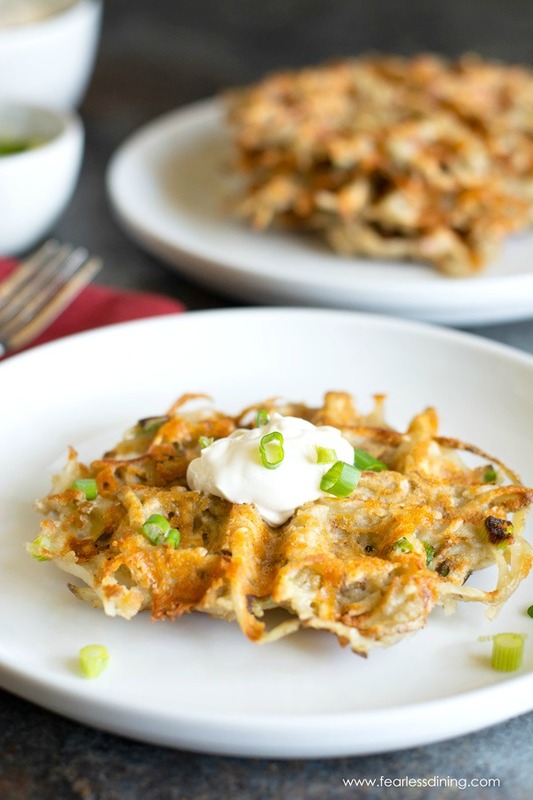 If you are a potato and cheese lover, these crispy cheddar hash brown waffles are going to make your day! These cheesy waffle iron hash browns are perfect for breakfast, or a side dish. Can you imagine a fried egg on top? It is making me hungry to just think about it! Use gluten free panko to keep this recipe gluten free! I love savory recipes made in a waffle iron. I shared this Curry Sweet Potato Waffles recipe not too long ago and it was a huge hit in our house. My kids also surprised me when they liked these Crispy Eggplant Parmesan Rounds that I baked in my waffle maker. Have you used your waffle iron to make non-traditional foods yet? I love to make hash browns in a waffle maker because it makes them super crispy, almost like a latke, without the greasy mess you would get from frying in hot oil. The secret to getting your potatoes to crisp up is to pat the shredded potatoes dry with a paper towel after you shred them. Potatoes can release a lot of water when they are shredded and blot up that moisture helps make your potatoes can crisp up. *Tip: If you want to save time, you can also use frozen hash browns to make these hash brown waffles. Just thaw out the hash browns and blot with a paper towel to dry. What is the best waffle iron to use to make hash browns? I like to use my Oster waffle maker to make savory waffles. It gets hot and food gets very crispy. I will say that clean up isn’t the easiest with this brand of waffle iron though, so consider using a waffle iron where the plates remove for easier clean up. How to cook potatoes in a waffle iron? It is so easy to cook hash browns in a waffle iron. The first step is to shred and dry your potatoes. Add shredded potatoes, cheddar cheese, gluten free bread crumbs, scallions, an egg, and seasoning to a bowl and mix well. Plug in your waffle maker to preheat. Make sure it is hot before you add your hashbrown potato mixture. I like to spray my waffle iron with olive or avocado oil to simulate it frying in oil. I like this easy to use oil mister for this purpose. Add a medium sized dollop of the shredded potato mixture onto the waffle iron. Add your hash brown potato mixture to the hot waffle iron and close the lid. Cook time varies per brand, and how hot the waffle iron gets. These hash brown waffles took about 5 minutes to cook. How do you get the hash brown potatoes to stick together? I used egg and cheese to help bind the shredded potato together for this savory waffle recipe. If you need this recipe to be egg free, consider using an egg replacer. Easy crispy hash brown waffles you make in your waffle iron. Wash the russet potatoes. Shred them with a shredder into a bowl. Use a paper towel to blot the extra moisture from the shredded potatoes. Add all ingredients to the shredded potatoes and mix well. Open the waffle maker and spray with olive oil. Serve with sour cream, applesauce, or any topping you like. Oh my goodness this looks so delicious and perfect for weekend brunch! Can’t wait to try this recipe! YUM! Looks YUM 😋 I’ve never had a waffle maker but I think I can use the non-stick pan, can’t I? What an AMAZING idea! This is a great breakfast for me and my family! I like that it is possible to cook quickly and easily. This is perfect for me. I definitely want to try it and I’m sure it is very tasty! Thank you for sharing this great recipe! YUM! wow you got me at crispy and waffles! What a great idea to serve not only for breakfast but also as a side dish for dinner or to eat as an appetizer, Really lovely! I am a potato lover! I am a cheese lover! I am definitely a lover of food I can cook without splattering my kitchen with oil!!! I am so glad you like this Claire :-). Thank you so much for stopping by.